1) Preheat oven to 300F. In a small bowl, combine sugar, cinnamon and salt. In a large bowl, lightly beat egg white. Add pecans, stir until coated. 2) Spread pecans in a single layer on a baking sheet. Bake for 20 minutes. 3) Meanwhile, take brie out of packaging and place on a baking sheet lined with wax paper. Place in oven and let bake for 15 minutes, or until brie is very soft to the touch. 4) While the pecans and brie are baking, mix water, honey and blackberries in a small saucepan on medium-high heat. Set aside 5 fresh blackberries for later. The berries will start to bubble, keep mixing until you have a jam like consistency. Drain sauce to remove seeds and gently mix in the fresh blackberries. 5) Once the brie and pecans are done, take out of the oven and let cool for 5 minutes. 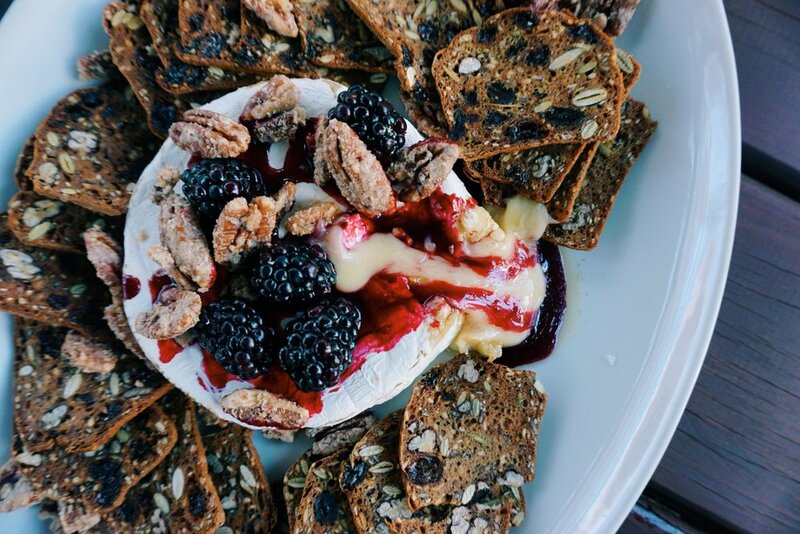 Place brie on a serving platter and drizzle with blackberry compote. Top with pecans and surround with crackers.